Shortly before the 2016 election, then-candidate Chris Sununu – who had a mixed record as an executive councilor when it came to funding abortion providers – wrote that he would support five specific “common sense” initiatives long pursued by pro-life voters. 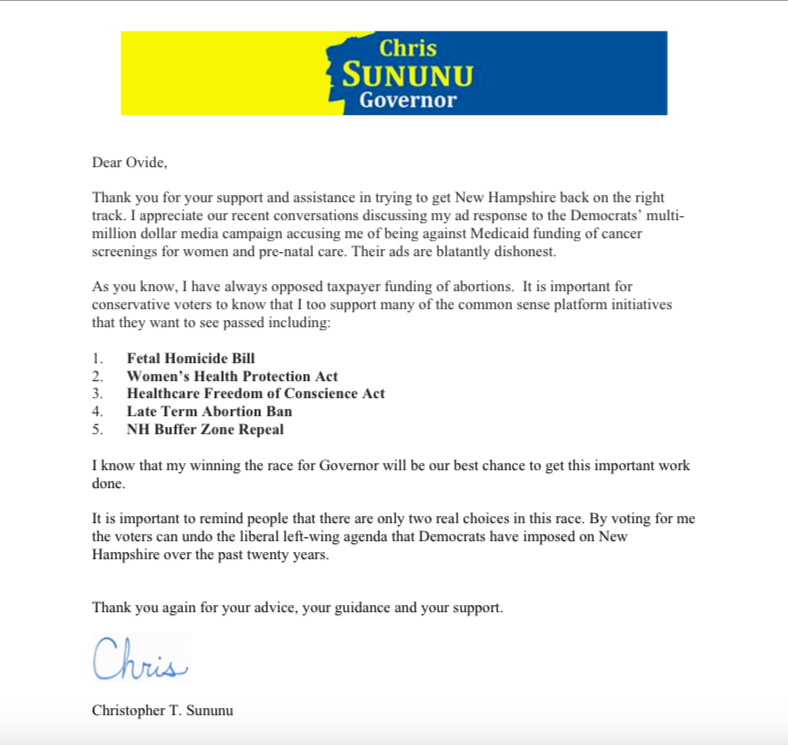 In an open letter addressed to attorney Ovide Lamontagne, Sununu cited “healthcare freedom of conscience” as one of them. We hope the legislature gives now-Governor Sununu a chance to follow through. HB 1787-FN will soon have a hearing in a House committee. The measure would acknowledge and protect conscience rights for health care workers who for religious, moral, or ethical reasons choose not to participate in abortion, artificial contraception, or sterilization. That’s something the Governor can promote. He can encourage legislators to send him the bill. He can encourage amendments if he thinks any are needed. He doesn’t have to wait silently until the bill gets to his desk. The Governor last year signed Sarah and Griffin’s Law, finally giving New Hampshire a fetal homicide statute. That was a good start. Now, it’s time to move the other initiatives forward. Governor Sununu should let legislators know he’s ready to welcome the conscience bill, along with the late-term abortion bill (HB 1680) and informed consent bill (HB 1707) already introduced. Letter released in 2016 by then-candidate (now Governor) Chris Sununu, outlining initiatives he could support.